If you’re a woman the best way to win an argument with your husband is to remind him you’re always right. If that doesn’t work you can bring out the big guns and threaten to withhold love and intimacy. No matter how stubborn your husband may be he will eventually cave. Okay, okay. The gig is up. This is really not an article on how to win an argument with your spouse. In fact, if your mindset is to come out the winner in arguments then you’ve already lost. It’s not about being correct or right! The goal in arguments needs to be about bringing resolution, understanding, connection, and change. With a better understanding of what the goals in an argument need to be I want to identify a few rules of engagement that will help you and your spouse move from conflict into connection and creating positive and lasting change. Speak in the first person. By following this simple guideline you’ll avoid blaming statements that often put your spouse on the defensive. Use “I” statements in place of “You” statements. “I feel”, “I think”, or “I want” and “I need” will help to keep the conflict from escalating into a full blown argument. Avoid global, sweeping statements such as “Always” and “Never.” These statements indicate black and white thinking which is a sign of immaturity. 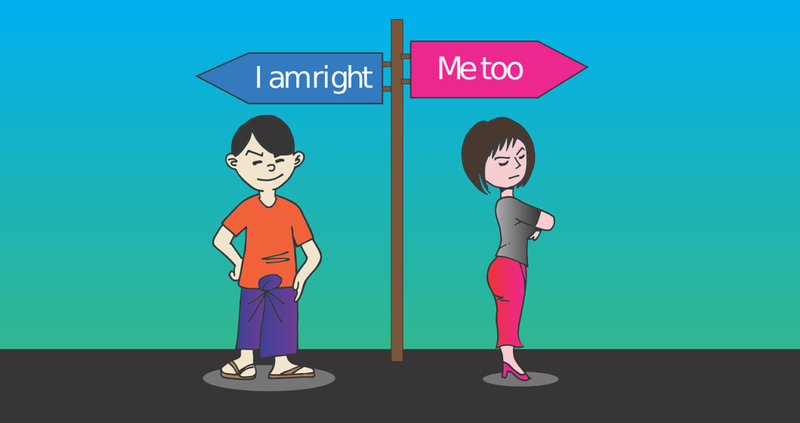 “Always” and “Never” statements also trigger defensiveness and escalate conflict. When starting a sentence in the second person and combining it with global statements it sounds something like this: “You always forget to call me on your way home,” or “You never remember to take out the trash.” Again, the problem is these are attacking words that create defensiveness and escalate conflict. Slow down and tune in. When the conversation turns into full on conflict it’s time to take a time-out so that you can take a tune in. The goal is to slow down your reactions and chose how you want to respond. The idea behind tuning in is to identify what you and your spouse are feeling deep down inside. Share your deeper emotion. Now that you have tuned in try sharing the softer emotion with your spouse. It could be sadness, hurt, fear, loneliness, and it could even be anger. The difference is sharing the emotion in a vulnerable way that helps your spouse to understand you and where you are coming from. Emotions have needs. When we share our emotions we also have needs that are connected to them. For instance, when I am afraid I may need safety and security. When I am sad I may need comfort and care. When I am angry it might be that I will need validation, understanding, and change. When I am feeling happy it could be that I will need others to celebrate with me and share in my joy. The steps are to slow down, tune in to yourself and your spouse, share your vulnerable emotions and the needs that you have. Finally, once you have deescalated conflict and moved towards connection the next step is to create change. This is where as a team your work together to identify what change you want to see in the relationship or with the issue you were discussing. Come up with a 1 or 2 action steps that you’ll differently. For example, maybe as a team you both decide to text one another if you’re going to be late. Or perhaps you decide to not spend any money over a certain amount unless you first run it by your spouse. The ultimate goal here is utilize the connection and understanding you worked so hard to achieve and turn it into quantifiable change. If you would like to listen to Travis and Kari Frye on The Connected Life radio show discuss this topic click here. Are you looking for help in your marriage? A Crossroads marriage therapist may be just what you need. To learn more about our marriage and couple’s counseling services in Scottsdale and Phoenix click here or call us at 623-680-3486.